Waiting on Wednesday is a weekly meme hosted by Jill at Breaking The Spine. It features each blogger's most anticipated books. This week my pick is Butter by Erin Jade Lange. 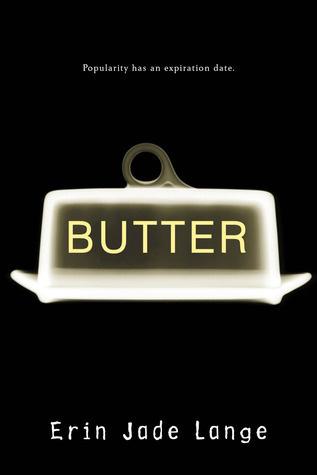 "A boy everyone calls “Butter” is about to make Scottsdale High history. He’s going to eat himself to death live on the Internet – and everyone will watch. He announces his deadly plan to an army of peers and expects pity, insults or even indifference. Instead, he finds morbid encouragement. When that encouragement tips the scales into popularity, Butter has a reason to live. But if he doesn’t go through with his plan, he’ll lose everything." Why I Can't Wait: I am equally disturbed and intrigued by premise of this book. I'm curious to know what drives Butter to "eat himself to death live on the Internet". What does he end up doing? I must know! This one does sound like a car wreck. Something you don't want to read it but can't help it. Interesting pick. This sounds disturbing and intriguing at the same time. Great pick!! I think my first reaction after reading this summary is WHOA! Totally grotesque and fascinating. A really interesting pick! How does he eat himself? Why do I want to bake cookies after looking at the cover? Cool choice Lena - I like sick and twisted to I'll be looking for this one.